Biomarkers are signposts of the body condition. Biomarkers – bio is for biological and markers – for molecules indicating that something is going wrong or differently in the body. They can help doctors to read these changes and identify a condition or disease. There are biomarkers for heart disease, cancer, diabetes and many others. 2. What type of molecules can serve as biomarkers? Various types of molecules can do the job as long as they can differentiate the normal and abnormal process in the body. It can be DNA, RNA, proteins and hormones. These molecules can be detected in the blood, urine, stool, tumour tissue or any other bodily tissues or fluids. 3. How can we discover novel biomarkers? Research, research and again research. We have to learn more basic facts about DNA, RNA and proteins. 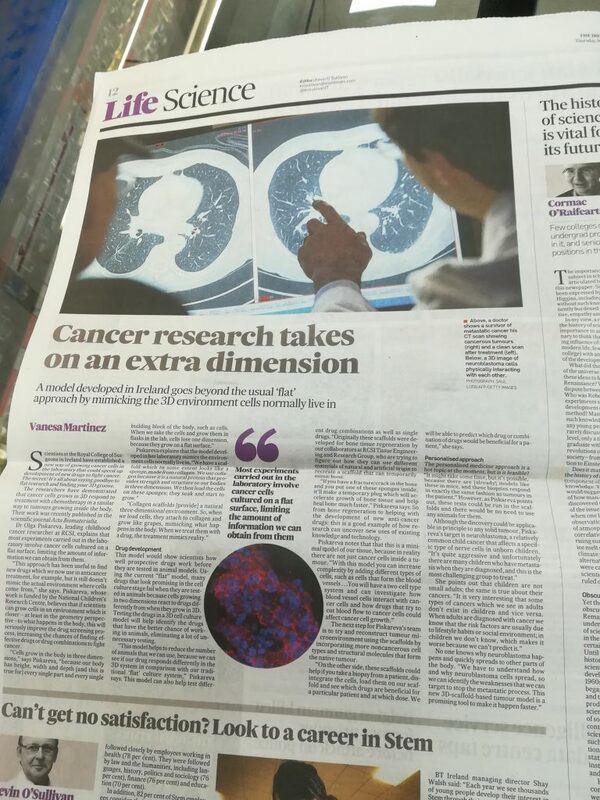 We need to be able to link this knowledge with health conditions including cancer. We need to identify how these molecules speak about the unhealthy conditions. We need to explore whether biomarkers exist within the disease that can predict the response to treatment and outlook. 4. What biomarkers are known in neuroblastoma? There are various biomarkers that are specific for neuroblastoma. Catecholamines in urine are chemicals produced by neuroblastoma cells. 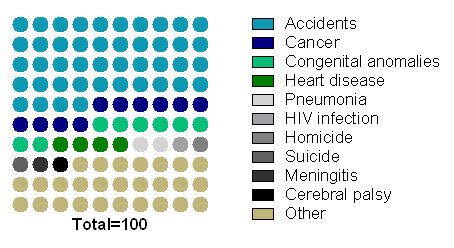 Chromogranin A – is a protein that can be detected in the blood. It is unspecific biomarker because it can be secreted by neuroblastomas and some other tumours (e.g. pancreas and prostate cancer). Various chromosomal aberrations can be biomarkers of neuroblastoma aggressiveness. 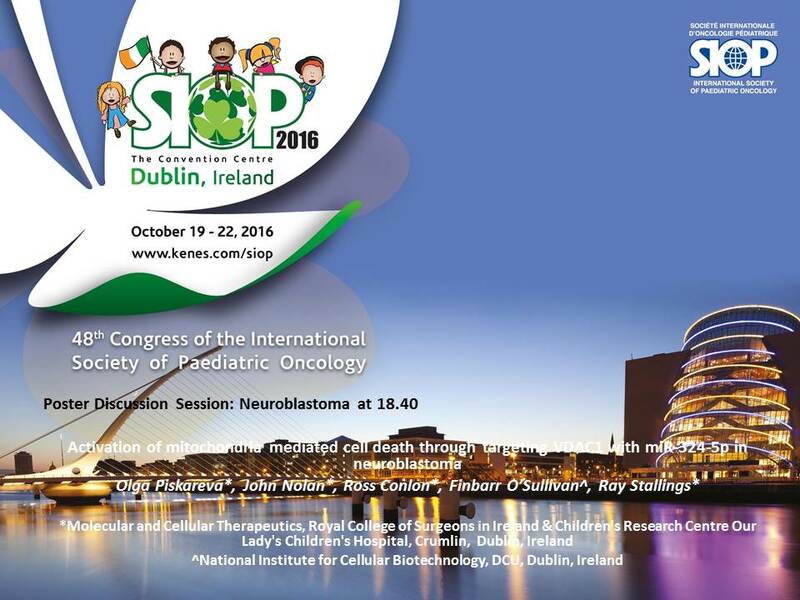 One of the strongest predictors of rapid neuroblastoma progression is MYCN status. The MYCN is a proto-oncogene protein and a member of the MYC family of transcription factors. MYCN was identified in 1983 and very soon became a routine biomarker for neuroblastoma aggressiveness. This protein is very important for the normal embryo development. 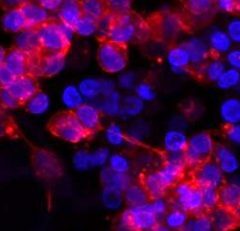 The amplification of this gene leads to the excess of MYCN protein in cells prompting cells to grow and divide faster transforming normal cells into tumour cells. 6. How did we detect MYCN in neuroblastoma cell lines? A day before the demonstration, we carried out some preparation steps. We selected several neuroblastoma cell lines with known MYCN status. Some cell lines had MYCN amplification, other didn’t. Among those that did have the amplification, the expression of MYCN protein was different giving us a good illustration of biomarker’s quantity. 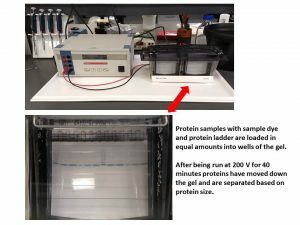 So, we run SDS-PAGE, a technique that helps to separate the cellular protein mix based on their size. Then the separated proteins were transferred onto a membrane and exposed to a buffer containing an antibody for MYCN (primary antibody). This antibody recognises only MYCN. 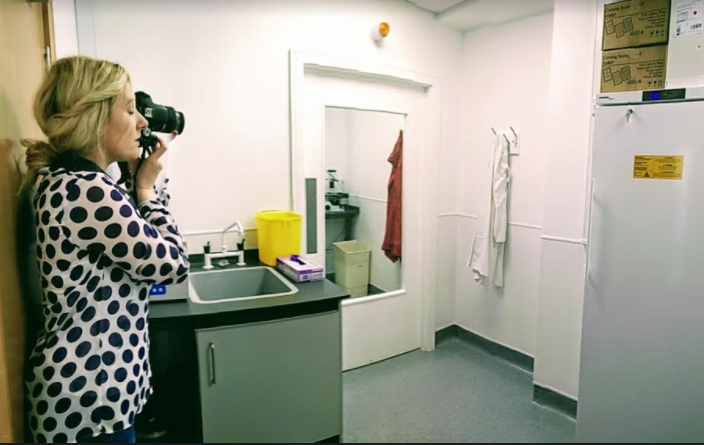 At the next step, we added another antibody that has a dual role – it can attach to the primary antibody and produce a signal that can be visualised. 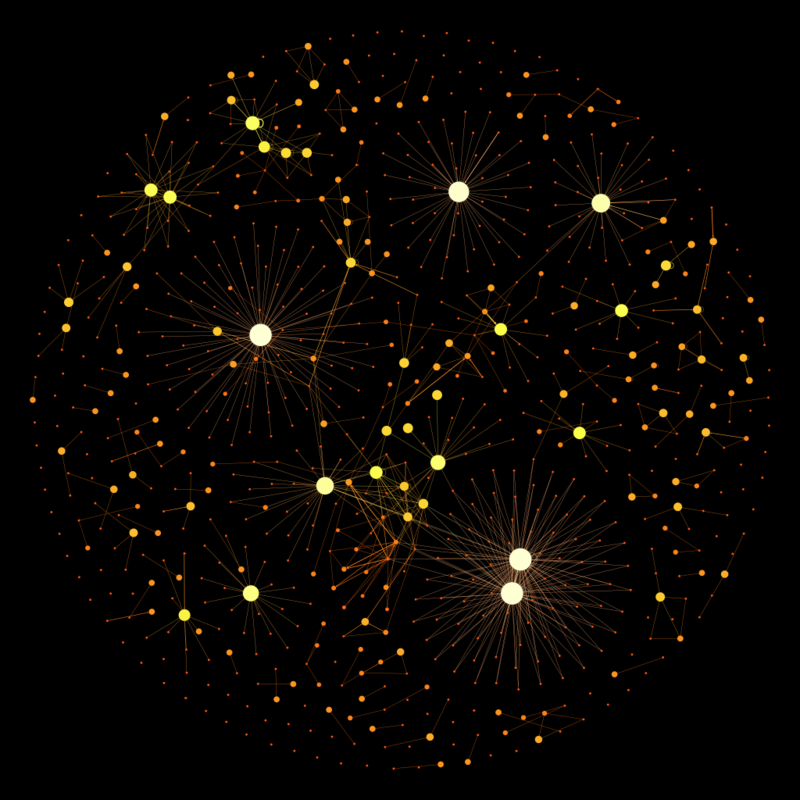 The next step would have been the visualisation itself and the one for Lab Safari. So, we were ready. Once we finished the basics of biomarkers, we moved to the biomarker MYCN detection step. The buffer for visualisation was added and the membrane was imaged. If you like this idea and want to have this demonstration for your science classes at school, please contact me and we would be happy to do it for you. 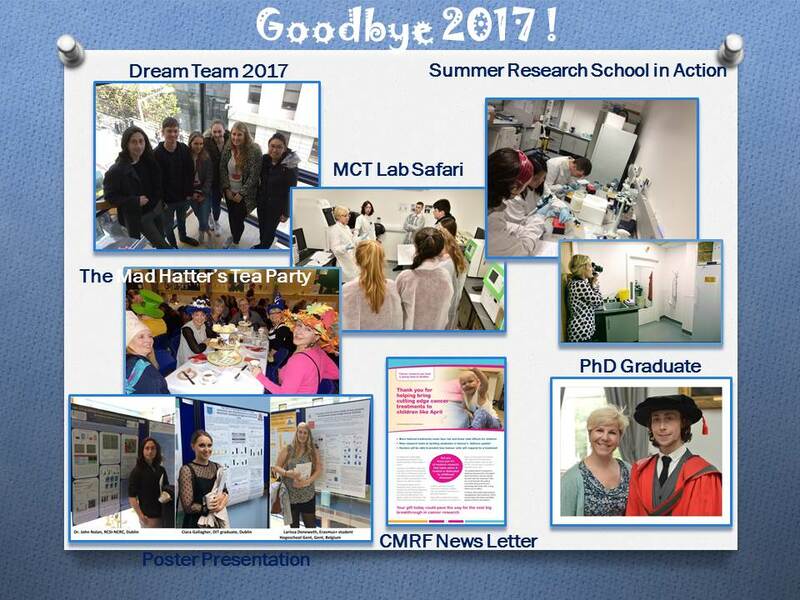 It is always a pleasure to host undergraduate students during summer months. 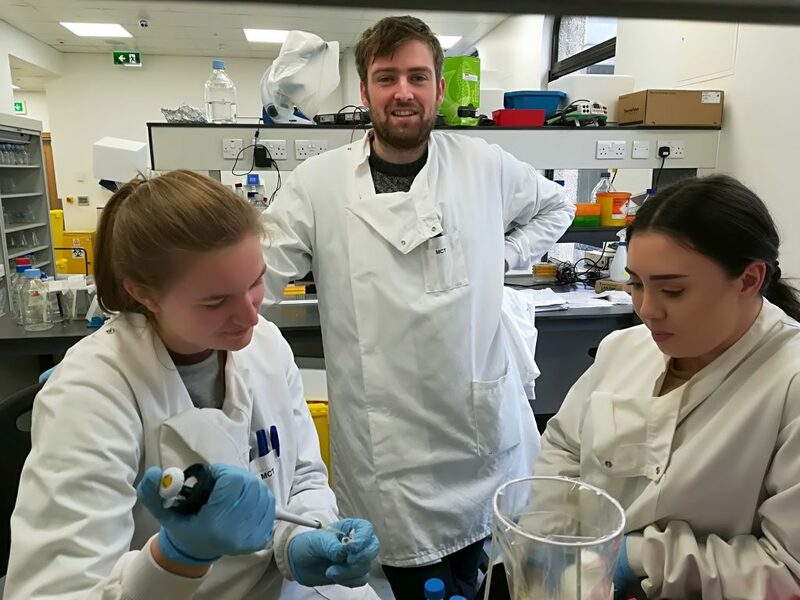 Two students joined the RCSI Research Summer School (RSS) Programme. 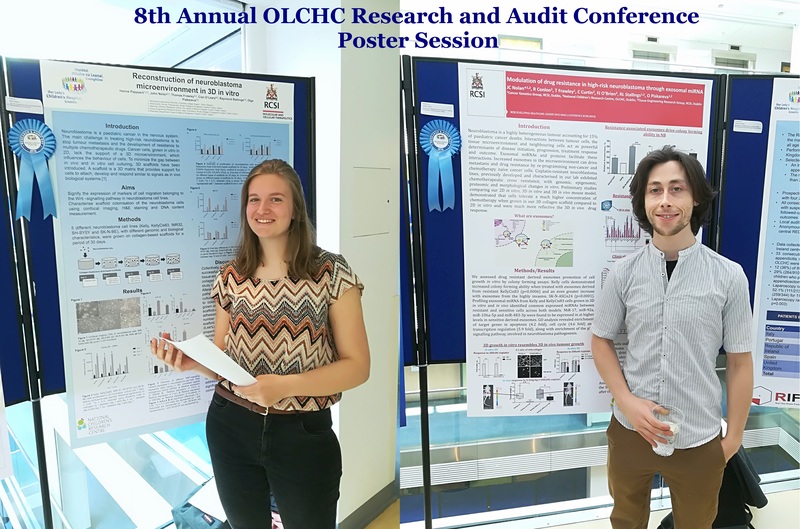 Both are working on the NCRC funded project to understand mechanisms that drive neuroblastoma pathogenesis. None of them had a prior lab experience, but nothing is impossible under John’s supervision. 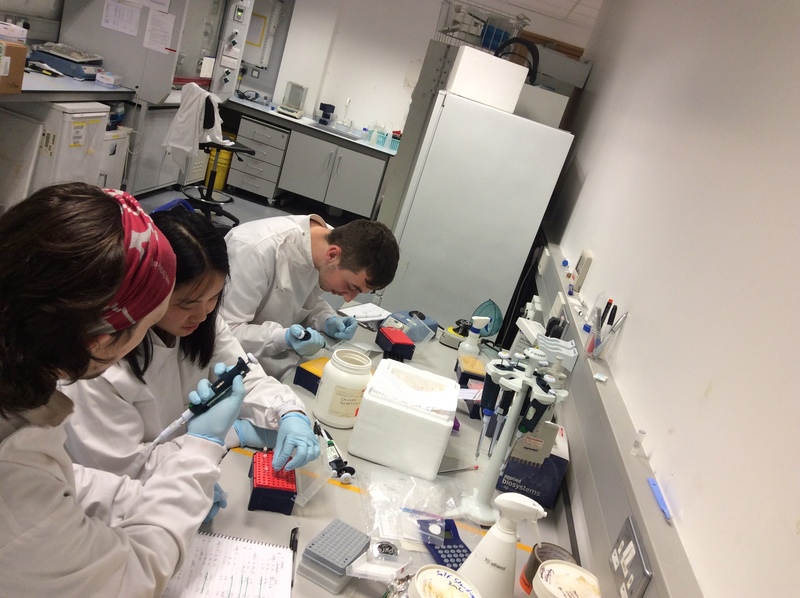 A full concentration on every single step of the research. 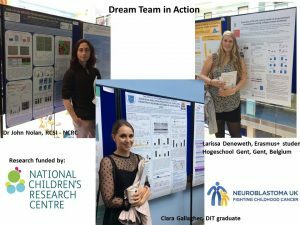 A Research Project Grant funded by National Children’s Research Centre will be starting in April. 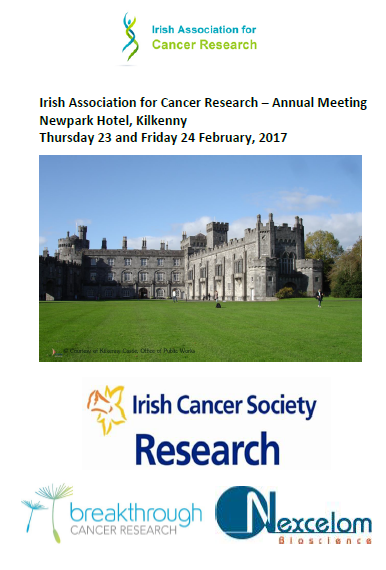 The ultimate aim is to identify biomarkers of tumour response to drugs in the blood of children with high-risk neuroblastoma. Challenge: Treatment regimens for patients with high-risk neuroblastoma involve intensive, multi-modal chemotherapy. Many patients response to initial therapy very well, but has only short-term effects, with most becoming resistant to treatment and developing progressive disease. The project has two parts which complement each other. We will study cell-to-cell communication using cell-based models. We will collect exosomes, small envelopes containing bioactive molecules, produced by drug-resistant cell lines to treat non-cancerous cells. We will measure the effect of exosomes on non-cancerous cells by counting cell growth, examining their shape and metabolism. We will also examine whether non-cancerous cells treated with exosomes become less responsive to chemo drugs. 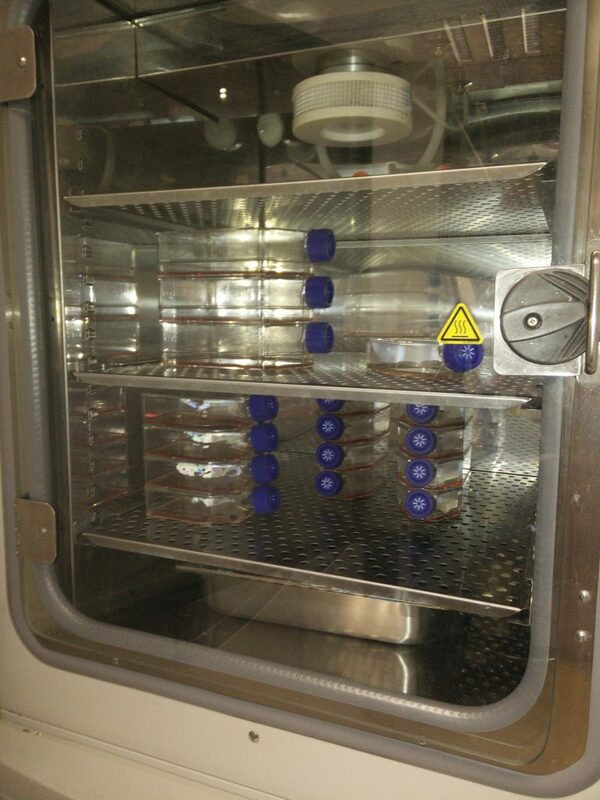 We will treat neuroblastoma cells with a drug and collect exosomes before and after treatment. We will profile exosomes to identify any changes in their miRNA content. MiRNA are very small pieces of genetic material that can change the way cell feels and works. This step will help to find biologically active miRNA that can trigger cell resistance to drugs. These biologically active miRNA can represent biomarkers of tumour response to chemotherapy. We will screen clinical samples for exosomal miRNA in response to drug treatment. 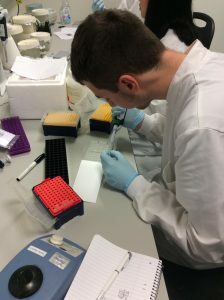 We are planning to use a small sample of blood taken from neuroblastoma patients during routine examinations before, during and after chemotherapy.This step will help to find clinically relevant miRNA of tumour responsiveness to chemo drugs. How does this project contribute to the biomedical community? This study aims to contribute to the better understanding of the disease mechanisms and scientific knowledge in the area, and in particular how neuroblastoma cells communicate with other cells helping tumour to create a unique microenvironment and protect themselves from chemotherapy pressure. 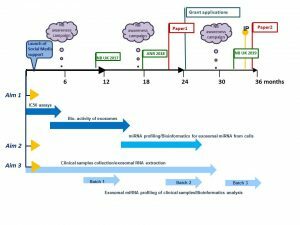 The new data will give insights in biologically active proteins and miRNAs involved in cell-to-cell communication and drug responsiveness. What are potential benefits of the proposed research to neuroblastoma patients? 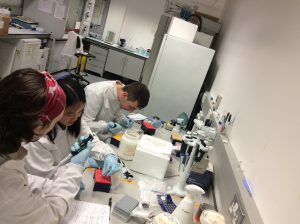 This project aims to develop exosomal biomarkers of tumour response to drugs that might be used to help select patients for treatment and identify novel targets for the development of more effective personalised therapy with the anticipated improvement in outcomes. 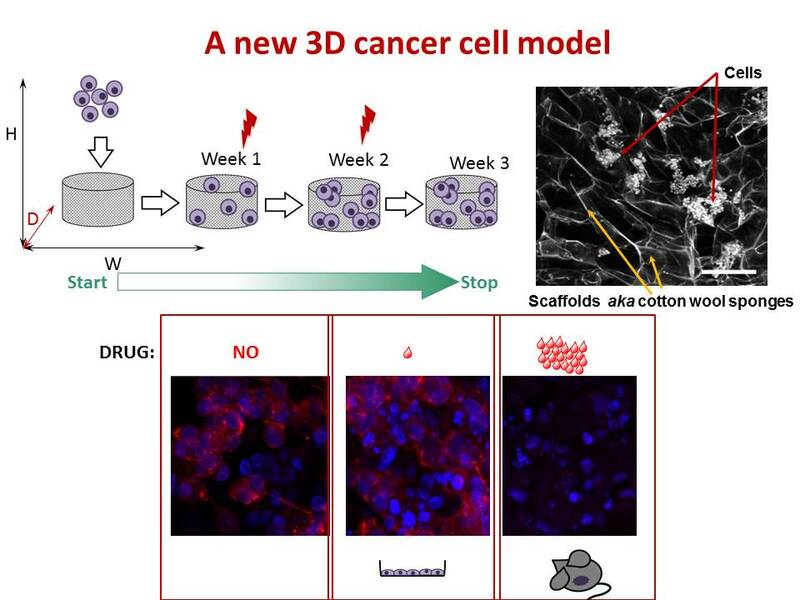 This work will contribute to the more efficient design of re-initiation treatment, sparing patients unnecessary rounds of chemotherapy and ultimately increasing survival. These new circulating markers will benefit children with high-risk neuroblastoma whose tumours are relapsed leading to less harmful and more tailored treatment options and improving their quality of life. This post is dedicated to parents of children with neuroblastoma. Some parents asked about DFMO – a re-purposing drug. 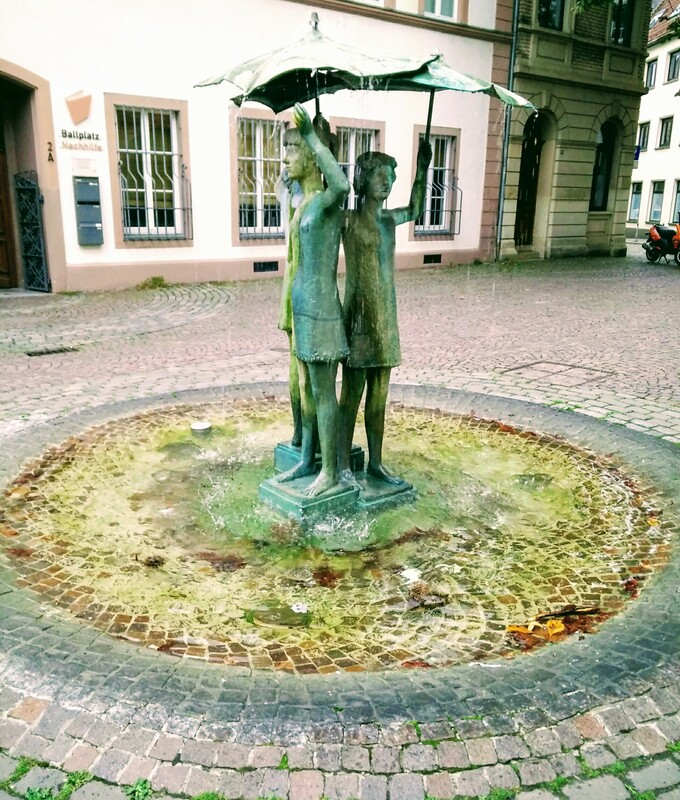 In this post, I tried to collect and summarize information available from academic sources. Difluoromethylornithine (DFMO, Eflornithine) is an anti-protozoan drug. It was originally developed and FDA approved for the treatment of Trypanosoma brucei gambiense encephalitis (“African sleeping sickness”). DFMO permanently binds to ornithine decarboxylase (ODC), an important enzyme in polyamine metabolism, and prevents the natural substrate ornithine from entering the active site. By inhibiting ODC, DFMO reduces cellular polyamines and inhibits cell growth and proliferation of actively dividing cells, thus making DFMO an attractive candidate for cancer therapy. In neuroblastoma, a positive regulation of all aspects of polyamine metabolism by MYCN was reported (revived by Bassiri 2015, Gamble 2012). So, it is believed that MYCN amplified neuroblastomas would most benefit of the drug. Q2: How intense is basic science behind DFMO in neuroblastoma? 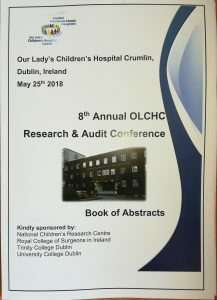 To find out the intensity of basic science on DFMO in neuroblastoma search for ‘difluoromethylornithine/DFMO/Eflornithine’ and ‘neuroblastoma’ was run in PubMed, a web-based resource with 26 million citations for biomedical literature from MEDLINE, life science journals, and online books. 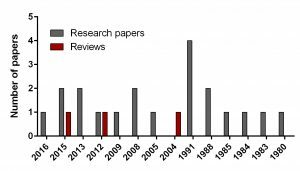 The search returned 23 papers including 3 reviews and 20 primary research reports published from 1980 to present. In comparison, I did another search for a novel drug Unituxin (dinutuximab) approved by FDA in 2015. It is monoclonal antibody against the glycolipid disialoganglioside GD2, a biomarker specific for neuroblastoma. Search for ‘anti-GD2 antibody’ and ‘neuroblastoma’ returned 181 papers including 25 reviews and 156 primary articles for the same period. Q3: Is DFMO in cancer clinical trials? 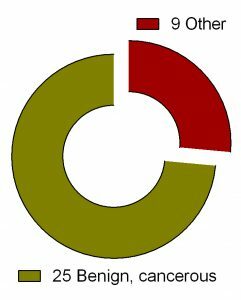 “ClinicalTrials.gov is a Web-based resource that provides patients, their family members, health care professionals, researchers, and the public with easy access to information on publicly and privately supported clinical studies on a wide range of diseases and conditions. The Web site is maintained by the National Library of Medicine (NLM) at the National Institutes of Health (NIH). Figure 2. Clinical trials of DFMO in various health conditions. Search for ‘difluoromethylornithine/DFMO/Eflornithine’ in ClinicalTrials.gov returned 36 registered trials across different health conditions.Two of these were withdrawn, the breakdown for the rest 34 is as follows: Adenomatous Polyp (1), Anaplastic Astrocytoma/Recurrent Anaplastic Astrocytoma (1), Bladder Cancer (1), Cervical Cancer/Precancerous Condition (1), Colorectal Cancer (3), Esophageal Cancer (1), Familial Adenomatous Polyposis (1), Gastric Cancer/Gastric Intestinal Metaplasia (1), Hirsutism (2), Human African Trypanosomiasis (5), Neuroblastoma (7), Non-melanomatous Skin Cancer/Precancerous/Nonmalignant Condition (4), Post-solid Organ Transplant/Skin Neoplasms (1), Precancerous Condition (1), Prostate Cancer (2), Pseudofolliculitis Barbae (1), Type 1 Diabetes (1) (Fig. 2). To see full details of 34 trials please click at this Table. All of them have various statuses (Fig. 3) as well as study design. Importantly, 30 out of 34 studies are focused on safety and efficacy of this drug. Vast majority of studies of DFMO in adult cancers/benign conditions are randomized (16/18 or 89%). Randomization in assignment of patients in studied groups (control and new drug/combination) helps minimize researcher’s bias when comparing effect of the new treatment vs current/no treatment. 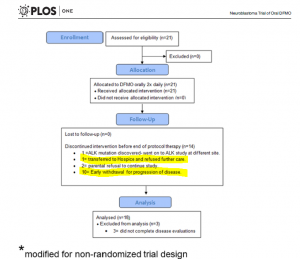 All trials of DFMO in neuroblastoma are not randomized. Instead, studies use a single group assignment. Three trails have been either completed/terminated and published results are available at ClinicalTrials.gov (NCT01059071, NCT00033371. NCT00118365). Q4: What about clinical trials of DFMO in neuroblastoma? Seven clinical trials on DFMO in neuroblastoma are registered with ClinicalTrials.gov (NCT01586260, NCT02395666, NCT01059071, NCT02679144, NCT02139397, NCT02030964, NCT02559778). One of these has been completed and results are available – ‘Safety study for refractory or relapsed neuroblastoma with DFMO alone and in combination with etoposide (NCT01059071)’. The trial NCT01059071 was a Phase 1 clinical trial. A phase I clinical trial tries to find out whether a new treatment/drug is safe, what its side effects are, the best dose of the new treatment, if the treatment shrinks the cancer. Twenty one patients were enrolled and eligible for treatment with DFMO and DFMO + etoposide. 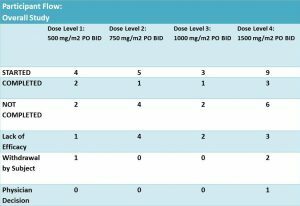 These patients were assigned into 4 groups of different DFMO doses (Fig. 4). The treatment was in cycles of 21 days. Cycle 1 – DFMO only followed by cycle 2 – combined treatment of DFMO+etoposide (14 days) and DFMO only (the last 7 days). According to results of the trial: 14 patients did not complete the treatment due to different reasons. It was not clear what stage/cycle they left the trial. More details on this trial were provided in the corresponding paper ‘A Phase I Trial of DFMO Targeting Polyamine Addiction in Patients with Relapsed/Refractory Neuroblastoma‘ published in PLOS ONE. PLOS ONE is peer-reviewed, open-access online resource reporting scientific studies from all disciplines. .
Q5: How the study was designed? Figure 5 is adopted from Sholler GL et al, PLoS One. 2015 May 27;10(5):e0127246. Q6: What are main findings of the clinical trial NCT01059071? 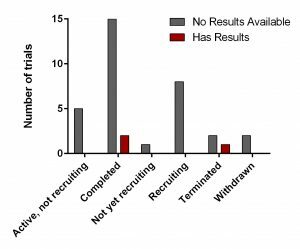 The overflow of the study is presented in Fig 5 providing additional information on those who did not complete the trial. Out of 14 participants, disease has progressed in 11 patients – it is 52% of the enrolled participants. Authors highlighted that this phase I study was not designed to evaluate anti-tumour efficacy of DFMO. But tumour response and clinical response were monitored during the study. According to the paper, 21 patients received at least one dose of DFMO only (Cycle 1, 21 days). During this cycle, 3 patients were withdrawn. All of them were assessed for safety of DFMO. Adverse effects in response to DFMO alone were: anemia – 3, ANC decrease – 2, decreased platelet count – 2, ALT increase – 1, AST increase – 1, anorexia – 1, constipation – 1, diarrhea – 1, infection (conjunctivitis) – 1, hypoalbuminemia – 1, hypophosphatemia – 1, increased GGT – 1, sleep disturbance – 1, urinary retention – 1 and vomiting – 1. Eighteen of them completed cycle 1 and continued treatment with DFMO+etoposide for another 4 cycles followed with DFMO only therapy for a number of cycles. Their clinical response data were examined for efficacy of DFMO alone. Three out of 21 participating patients in this clinical trial remain alive and disease free between 2–4.5 years after starting DFMO. Evageliou NF, Haber M, Vu A, Laetsch TW, Murray J, Gamble LD, Cheng NC, Liu K, Reese M, Corrigan KA, Ziegler DS, Webber H, Hayes CS, Pawel B, Marshall GM, Zhao H, Gilmour SK, Norris MD, Hogarty MD. Polyamine Antagonist Therapies Inhibit Neuroblastoma Initiation and Progression. Clin Cancer Res. 2016 Sep 1;22(17):4391-404. doi: 10.1158/1078-0432.CCR-15-2539. Bassiri H, Benavides A, Haber M, Gilmour SK, Norris MD, Hogarty MD. Translational development of difluoromethylornithine (DFMO) for the treatment of neuroblastoma. Transl Pediatr. 2015 Jul;4(3):226-38. doi: 10.3978/j.issn.2224-4336.2015.04.06. Review. Saulnier Sholler GL, Gerner EW, Bergendahl G, MacArthur RB, VanderWerff A, Ashikaga T, Bond JP, Ferguson W, Roberts W, Wada RK, Eslin D, Kraveka JM, Kaplan J, Mitchell D, Parikh NS, Neville K, Sender L, Higgins T, Kawakita M, Hiramatsu K, Moriya SS, Bachmann AS. A Phase I Trial of DFMO Targeting Polyamine Addiction in Patients with Relapsed/Refractory Neuroblastoma. PLoS One. 2015 May 27;10(5):e0127246. doi: 10.1371/journal.pone.0127246. Lozier AM, Rich ME, Grawe AP, Peck AS, Zhao P, Chang AT, Bond JP, Sholler GS Targeting ornithine decarboxylase reverses the LIN28/Let-7 axis and inhibits glycolytic metabolism in neuroblastoma. Oncotarget. 2015 Jan 1;6(1):196-206. Samal K, Zhao P, Kendzicky A, Yco LP, McClung H, Gerner E, Burns M, Bachmann AS, Sholler G. AMXT-1501, a novel polyamine transport inhibitor, synergizes with DFMO in inhibiting neuroblastoma cell proliferation by targeting both ornithine decarboxylase and polyamine transport. Int J Cancer. 2013 Sep 15;133(6):1323-33. doi: 10.1002/ijc.28139. Koomoa DL, Geerts D, Lange I, Koster J, Pegg AE, Feith DJ, Bachmann AS. DFMO/eflornithine inhibits migration and invasion downstream of MYCN and involves p27Kip1 activity in neuroblastoma. Int J Oncol. 2013 Apr;42(4):1219-28. doi: 10.3892/ijo.2013.1835. Passariello CL, Gottardi D, Cetrullo S, Zini M, Campana G, Tantini B, Pignatti C, Flamigni F, Guarnieri C, Caldarera CM, Stefanelli C. Evidence that AMP-activated protein kinase can negatively modulate ornithine decarboxylase activity in cardiac myoblasts. Biochim Biophys Acta. 2012 Apr;1823(4):800-7. doi: 10.1016/j.bbamcr.2011.12.013. Rounbehler RJ, Li W, Hall MA, Yang C, Fallahi M, Cleveland JL. Targeting ornithine decarboxylase impairs development of MYCN-amplified neuroblastoma. Cancer Res. 2009 Jan 15;69(2):547-53. doi: 10.1158/0008-5472.CAN-08-2968. Koomoa DL, Yco LP, Borsics T, Wallick CJ, Bachmann AS. Ornithine decarboxylase inhibition by alpha-difluoromethylornithine activates opposing signaling pathways via phosphorylation of both Akt/protein kinase B and p27Kip1 in neuroblastoma. Cancer Res. 2008 Dec 1;68(23):9825-31. doi: 10.1158/0008-5472.CAN-08-1865. 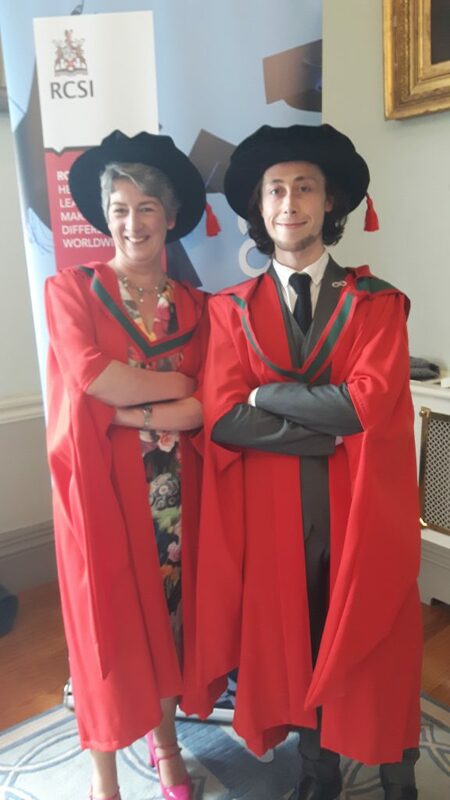 Hogarty MD, Norris MD, Davis K, Liu X, Evageliou NF, Hayes CS, Pawel B, Guo R, Zhao H, Sekyere E, Keating J, Thomas W, Cheng NC, Murray J, Smith J, Sutton R, Venn N, London WB, Buxton A, Gilmour SK, Marshall GM, Haber M. ODC1 is a critical determinant of MYCN oncogenesis and a therapeutic target in neuroblastoma. Cancer Res. 2008 Dec 1;68(23):9735-45. doi: 10.1158/0008-5472.CAN-07-6866. Wallick CJ, Gamper I, Thorne M, Feith DJ, Takasaki KY, Wilson SM, Seki JA, Pegg AE, Byus CV, Bachmann AS. Key role for p27Kip1, retinoblastoma protein Rb, and MYCN in polyamine inhibitor-induced G1 cell cycle arrest in MYCN-amplified human neuroblastoma cells. Oncogene. 2005 Aug 25;24(36):5606-18. Chen ZP, Chen KY. Differentiation of a mouse neuroblastoma variant cell line whose ornithine decarboxylase gene has been amplified. Biochim Biophys Acta. 1991 Dec 3;1133(1):1-8. Piacentini M, Fesus L, Farrace MG, Ghibelli L, Piredda L, Melino G. The expression of “tissue” transglutaminase in two human cancer cell lines is related with the programmed cell death (apoptosis). Eur J Cell Biol. 1991 Apr;54(2):246-54. Melino G, Piacentini M, Patel K, Annicchiarico-Petruzzelli M, Piredda L, Kemshead JT. Retinoic acid and alpha-difluoromethylornithine induce different expression of neural-specific cell adhesion molecules in differentiating neuroblastoma cells. Prog Clin Biol Res. 1991;366:283-91. Stephanou A, Knight RA, De Laurenzi V, Melino G, Lightman SL.Expression of pre-opiomelanocortin (POMC) mRNA in undifferentiated and in vitro differentiated human neuroblastoma cell lines. Prog Clin Biol Res. 1991;366:173-80. 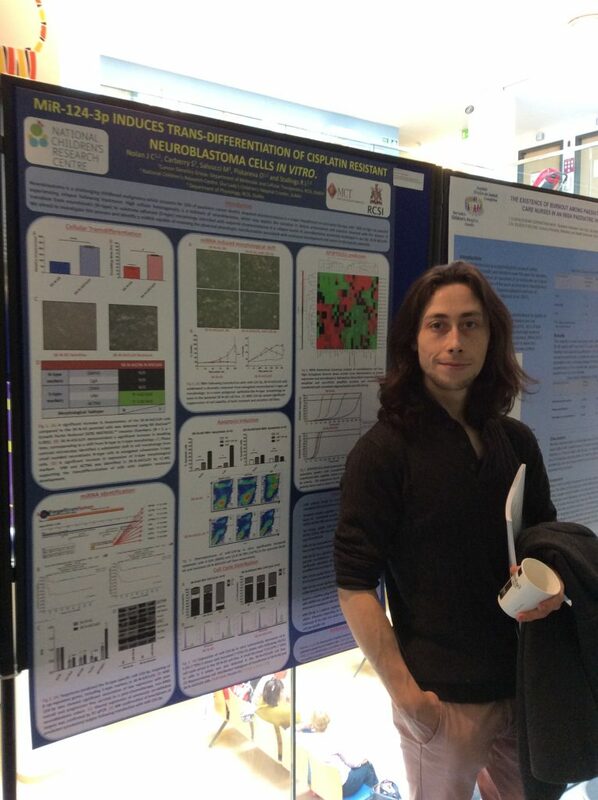 Melino G, Farrace MG, Ceru’ MP, Piacentini M. Correlation between transglutaminase activity and polyamine levels in human neuroblastoma cells. Effect of retinoic acid and alpha-difluoromethylornithine. Exp Cell Res. 1988 Dec;179(2):429-45. Chen KY, Dou QP. 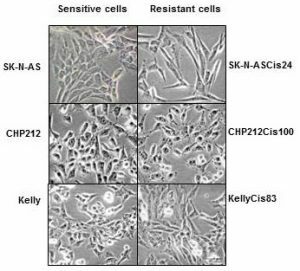 NAD+ stimulated the spermidine-dependent hypusine formation on the 18 kDa protein in cytosolic lysates derived from NB-15 mouse neuroblastoma cells. FEBS Lett. 1988 Mar 14;229(2):325-8. Karvonen E, Andersson LC, Pösö H. A human neuroblastoma cell line with a stable ornithine decarboxylase in vivo and in vitro. Biochem Biophys Res Commun. 1985 Jan 16;126(1):96-102. Pösö H, Karvonen E, Suomalainen H, Andersson LC. 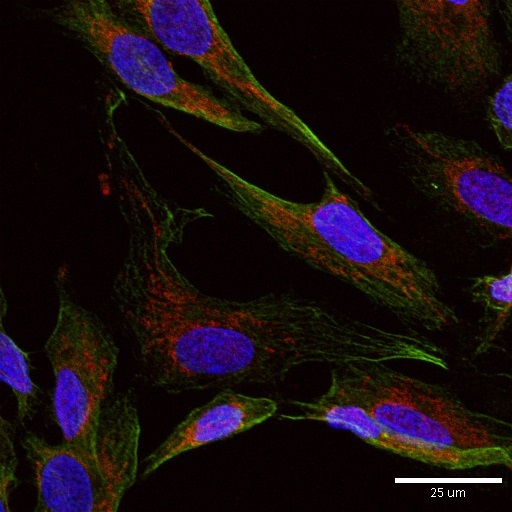 A human neuroblastoma cell line with an altered ornithine decarboxylase. J Biol Chem. 1984 Oct 25;259(20):12307-10. Chen KY, Nau D, Liu AY. Effects of inhibitors of ornithine decarboxylase on the differentiation of mouse neuroblastoma cells. Cancer Res. 1983 Jun;43(6):2812-8. Chapman SK. Antitumor effects of vitamin A and inhibitors of ornithine decarboxylase in cultured neuroblastoma and glioma cells. Life Sci. 1980 Apr 21;26(16):1359-66. No abstract available. I continue to share the meaning of research for non-science students. Zaki was a summer medical student in 2015. “I am a final year Malaysian medical student studying at RCSI. 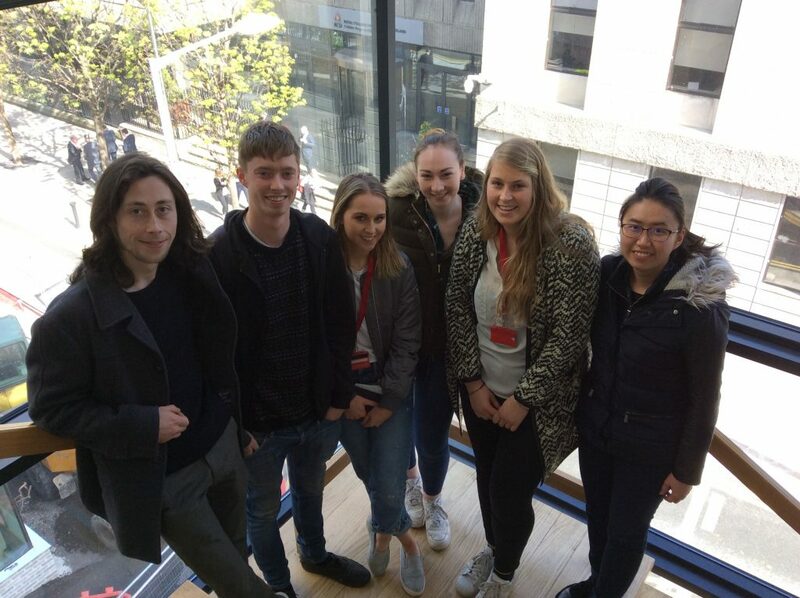 I had the opportunity to join RCSI Research Summer School (RSS) by assisting in research with Cancer Genetics, Molecular and Cellular Therapeutics Department of RCSI. 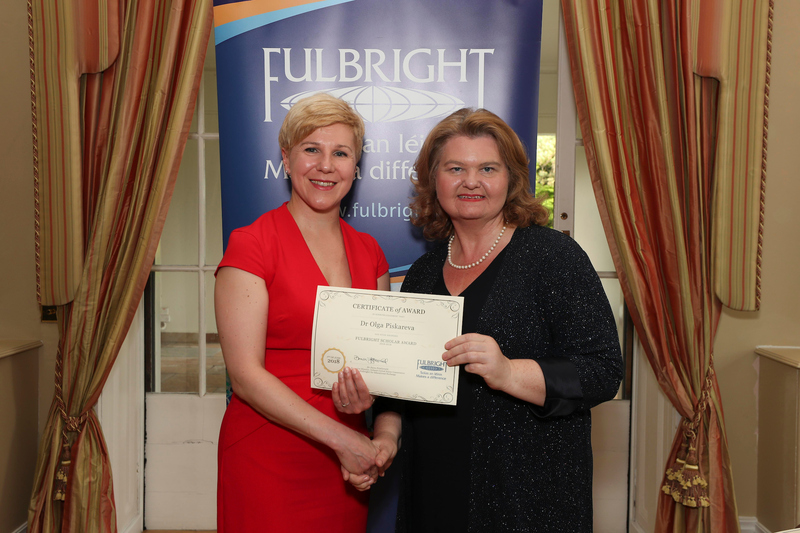 My mentor was Dr Olga Piskareva. 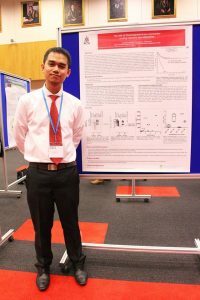 My research project investigated the role of chromogranin A as a biomarker in drug-resistant neuroblastoma by analysing its expression in different neuroblastoma samples of murine models. Frankly speaking, I had zero experience in clinical research (apart from basic science project I did at high school) before the placement started. The reading materials that Dr Piskareva handed to me felt like an alien language that had to be deciphered, let alone doing experiment with western blotting and ELISA. I remembered my first day at the lab, staring enthusiastically at every apparatus and machines but not knowing how to run them. Fortunately, Dr Piskareva and other lab buddies were very experienced and helpful enough with my insufficiency. 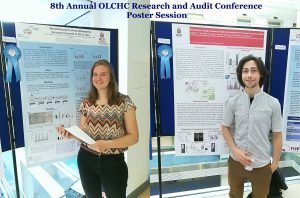 Their perseverance and willingness to share knowledge and tip built my confidence and understanding to finish my research project. I never had any difficulty to discuss and ask for help any time I needed it from them in the lab. They were also very warm and friendly not just inside the lab but also outside of the lab. I felt like we were one big multinational family in one small lab. 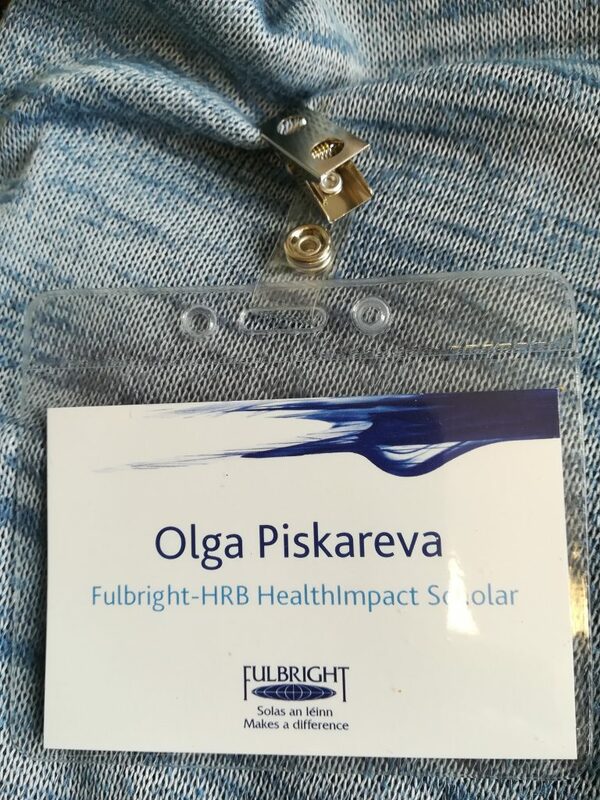 Imagine researchers coming from Russia, Ireland, Italy, Netherlands and myself from Malaysia working hand-in-hand, together. Over time, we bonded very close especially with our weekly breakfast getaway at Gerry’s and my friend Mei Rin and I even prepared our Malaysian cuisine for everyone in the lab in our last days. Even though most of my friends went home for the summer break, never did I felt lonely during my time in the lab. I am very grateful to have them in the lab and to call them my ‘keluarga’ (means family in Malay language). The 8 weeks RSS program went very swiftly and fast with weekly mandatory skills workshops and Discovery Lecture Series. 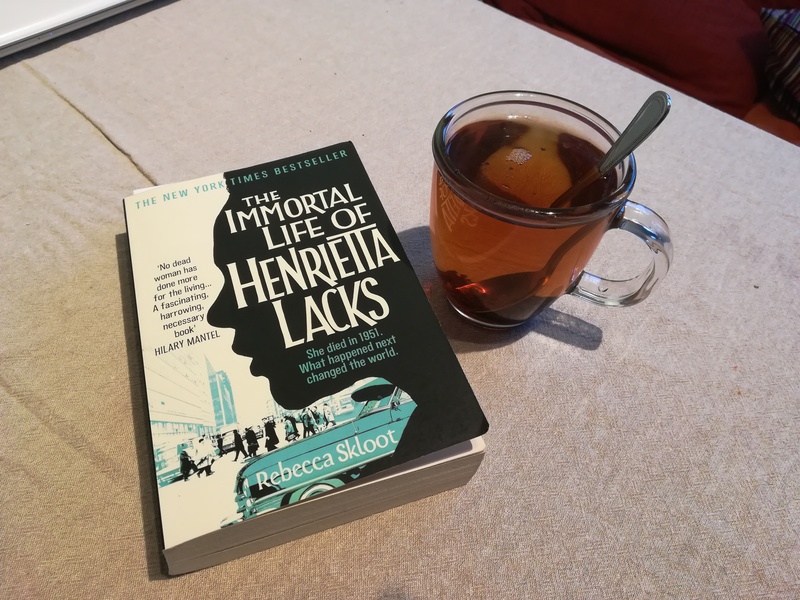 We also joined RSS book club discussing a very interesting read “The Emperor of all Maladies: A Biography of cancer” by Pulitzer Prize winner Siddhartha Mukherjee. After the research, I had the opportunity to do poster presentation at RCSI Research Day 2016 and International Conference for Healthcare and Medical Students (ICHAMS) 2016 at RCSI. These were great platforms for me to share my findings with other researchers. Above all, these were made possible with the help of Dr Piskareva and my lab buddies in preparing the poster and full report of the research. Additionally, the findings also provided me with extra information about neuroblastoma in line with my medicine study in paediatrics. I would cherish every moment in the lab and indeed it was a very priceless experience. I would very much do it all over again in the lab if I had the chance because of the craving for knowledge and warmth of the lab buddies. 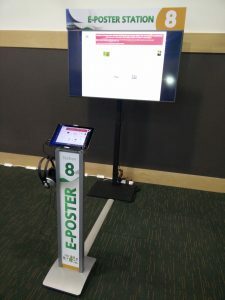 This is e-poster station, where anyone can look up all posters displayed during the meeting. Tumour cells send different types of messages from one cell to another aka people post letters, postcards, and parcels to their families, friends, colleagues or business. Cells can direct their messages using free moving proteins – postcards. They can wrap it in microvesicles with different cargo. Big microvesicles can take up big messages – parcels, small microvesicles or exosomes contain a limited number of texts – letters. Tumour cells change their behaviour quickly adapting to anticancer therapies, so the messages they are sending. These messages can easily join blood stream and be read by researchers to understand how treatment is working and tumour cells are feeling. Reading these messages from blood is more favourable as blood tests are done on the regular bases during and after the treatment. In our lab we investigate how neuroblasts communicate with each other and the entire body through exosomes. We are interested to see what they write in their letters – exosomes. 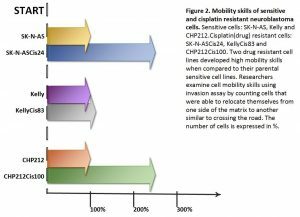 Do drug resistant and sensitive neuroblasts write different texts? What is the difference and how we can use this difference to predict child response to anticancer therapy? 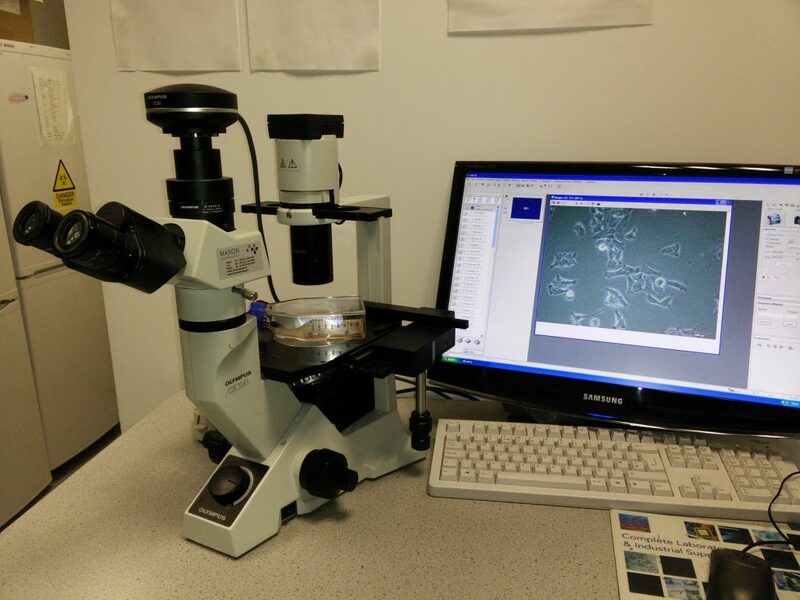 In one set of experiments, we found that exosomes from drug resistant neuroblasts stimulate growth of sensitive cells. The more resistant neuroblasts send more powerful messages pushing cells to grow faster. In the other set of experiments, we partially cracked the message showing that their texts are different. This finding explains why more resistant neuroblasts send more growth stimulating messages. 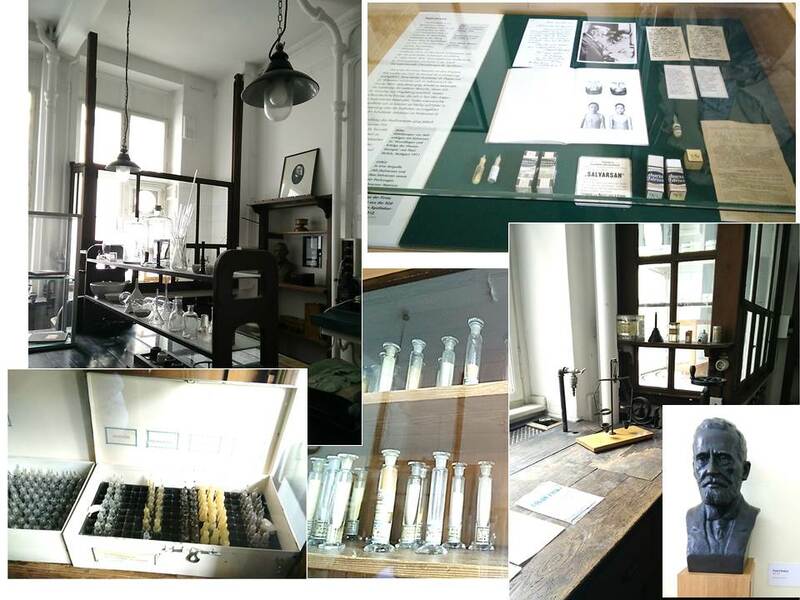 All these findings will be presented at the upcoming conference Goodbye Flat Biology: Models, Mechanisms and Microenvironment in Berlin. Schematic of exosome biogenesis and secretion. Cells produce exosomes through different pathways. This process is tightly regulated and controlled by numerous molecules. It can be triggered by many factors including extracellular stimuli (e.g., microbial attack, UV, drugs) and other stresses. The exosomes wrap up biologically active components such as proteins, RNA and miRNA. Exosomes can interact with recipient cells using four mechanisms: ligand/receptor interaction, protein transfer, membrane fusion or internalisation. Once exosomes entered the recipient cell, they release their content and re-programme the cell functions. 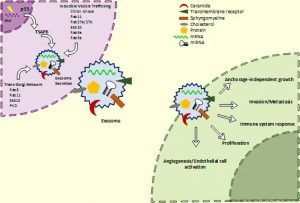 Johnsen KB, Gudbergsson JM, Skov MN, Pilgaard L, Moos T, Duroux M. A comprehensive overview of exosomes as drug delivery vehicles – Endogenous nanocarriers for targeted cancer therapy. Biochim Biophys Acta – Rev Cancer. 2014;1846(1):75–87. El Andaloussi S, Mäger I, Breakefield XO, Wood MJ a, Andaloussi S EL, Mäger I, et al. Extracellular vesicles: biology and emerging therapeutic opportunities. Nat Rev Drug Discov. 2013;12(5):347–57.